Understanding smart home product purchase patterns can help security dealers incorporate additional products and services, increasing revenue opportunities. The aggregate market for smart home devices has entered the latter side of early adoption and will approach “the chasm” soon. However, each device on its own remains squarely in the late innovator/early adopter phase. Only smart thermostats, now at 13% adoption, have broken the 10% marker, with IP cameras close behind at 9%. Cameras are a popular smart home product as security use cases have dominated the early smart home market, while the residential security channel was a natural avenue for smart home devices to enter high-end and early-adopter households. Networked cameras also give DIY options to households that have eschewed professional security options to avoid installation or monthly fees. 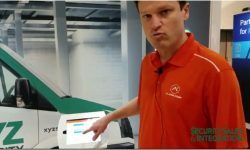 Parks Associates surveys indicate that households both with and without security systems could consider the remote monitoring and notification services provided by smart products as a sufficient substitute for professional monitoring. Smart home products will bring more households into the security industry, but security dealers must now compete against the DIY impulse of consumers. 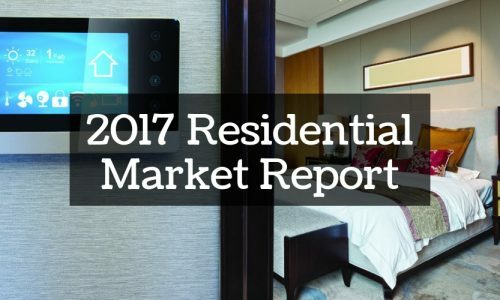 The market penetration rate of relative newcomer smart video doorbells quickly increased to 7% adoption within its first two years on the market, and this number will increase as Amazon’s acquisition of smart doorbell Ring at the beginning of 2018 brings more attention and marketing muscle to this category for all players. Not only will that inspire first-time buyers, many current smart home households will also make a purchase in this category, as the number of multidevice smart home households has increased exponentially recently. 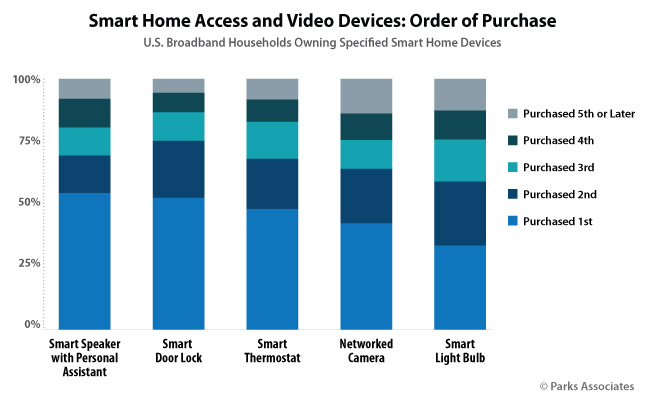 Of the 26% of U.S. broadband households that own smart home devices, 62% report owning more than one type of device, so the percentage of smart home device owners who own more than one type of device exceeds the percentage who only have one type of device. This represents a significant increase over the past year — 13% of broadband households reported having more than one device type in 2016, and 16% reported having more than one device type in 2017. 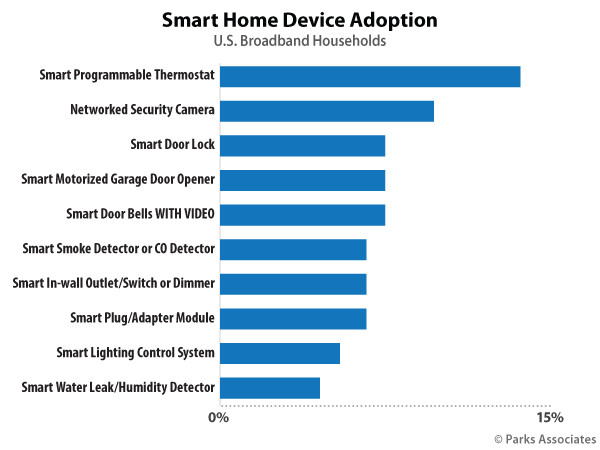 The six most popular smart home devices (smart thermostats, networked cameras, smart light bulbs, video doorbells, smart garage door openers and smart door locks) can be found in 22% of U.S. broadband households. Twenty-five percent of households that own smart home devices own all six top products. Consumers do not become multidevice owners all at once. Today, householders most often acquire smart home devices incrementally. 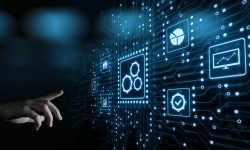 Many security providers and multisystem operators (MSOs) offer a bundle of components, but consumers are hesitant to acquire multiple products at one time. In many cases, consumers are not aware of the capabilities of these products and need to be convinced of their value. One device that serves as a good gateway to smart home purchases is the smart speaker with personal assistant, such as the Amazon Echo, Google Home, or Apple HomePod. Parks Associates classifies smart speakers as a unique CE category since their use cases overlaps among many industry areas (e.g., home control, energy, entertainment, etc.). 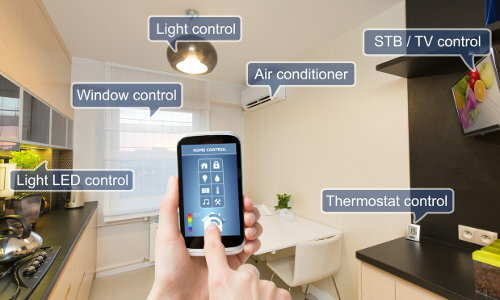 Because these devices connect to so many other solutions, and also enable a new experience through voice control, they are driving households to adopt smart home devices. Among consumers who own both smart speakers and smart home devices, 54% purchased the smart speaker first, before buying their smart home devices. No other device has a higher first-purchase rate. Security companies in particular can use the knowledge of the purchase process to develop offers pertinent to device buyers at every stage of smart home acquisition. A first-time device buyer can be lured into a voice-control solution or a system with a networked camera. For example, among the U.S. broadband households planning to buy a security system in the next 12 months, nearly 70% want a camera to be included as part of their security system purchase. Solutions targeting these first-time buyers could also include free technical support for a limited time or a free home WiFi inspection, to better entice the purchase. 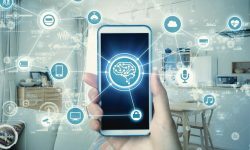 Among consumers buying their second, third, or fourth smart home device, the needs and interests will be different, and marketing messages that focus on highly valuable use cases, emphasizing value propositions that build off the benefits of each smart device in the home, will resonate with these households. Companies that promise to connect legacy devices with new purchases, guaranteeing interoperability among devices, will have an advantage. Twenty-two percent of U.S. broadband households purchased a smart home device in 2017, and nearly 50% plan to buy one in 2018. These consumer have and will purchase from a variety of channels. The top five channels for smart home device purchases are national retailers, online-only retailers, security dealers, HVAC contractors and broadband service providers. The top five channels for each device typically capture more than 80% market share. Retailers lead in the sale of smart home devices. National and local retailers experienced a slight lead over online-only retailers in 2017. 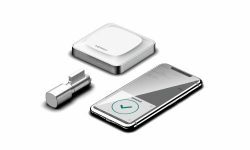 Security dealers and heating and cooling contractors are major players in the sale of smart smoke or CO detectors and smart thermostats, respectively. Consumers are more likely to have purchased those devices from the aforementioned sellers than they are to have purchased them from online-only retailers. The share of smart home device sales for custom installers is declining overall. Notable declines in the custom installer market share can be seen in the sale of smart sprinklers systems, smart security cameras, smart plug/adapter module, smart in-wall outlet/switch or dimmer and smart light bulbs. This market also has more than 50% of U.S. broadband households who do not own or intend to purchase a smart home device. A variety of factors inhibit their adoption, but the majority think the products will not benefit their lifestyles. In addition, 23% report security and privacy concerns, and 16% perceive smart home products will make their lives more complicated. 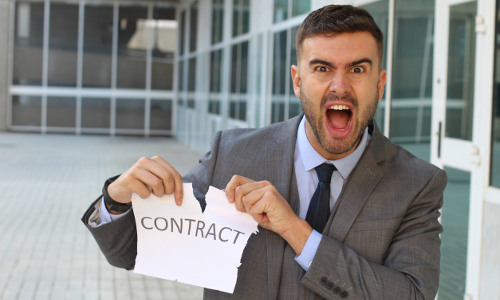 Security companies are in a unique position where they have the resources to demonstrate the benefits and also provide privacy assurances to a skeptical consumer. 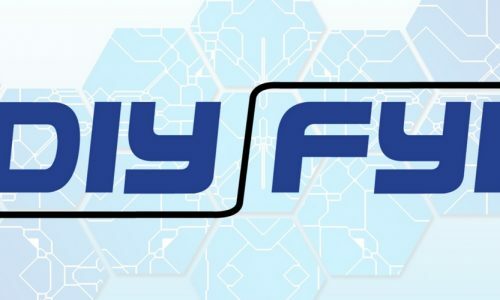 The buyer journey for smart home devices is different from the traditional security, CE, or home service purchase process, requiring adjustments to business strategies, but many of the flashpoints will be familiar to security companies — and they can leverage these advantages to differentiate from DIY and establish a stronger position in the smart home market moving forward. Patrice Samuels is a senior analyst at Parks Associates.